This year, he launched the first social-networking automobile so drivers can get Facebook, Twitter, texts and Internet connectivity and still keep their hands on the wheel and their eyes on the road. 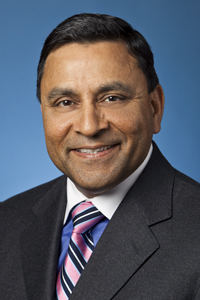 The trick, Dinesh Paliwal, chairman, president and CEO of Harman International Industries, tells Fast Company, was to develop technology that serves to combat drivers’ distraction, meet auto regulations, and bring 4G smartphone-like functionality to the car. If he makes it sound simple, it’s because solving complex technological problems comes easily to this engineer with an MBA. In fact, Paliwal sports a list of accomplishments so long (including serving as Chairman of the U.S. National Foreign Trade Council and turning a profit on the multi-billion dollar North American region for his former employer ABB following 18 years of losses) that combining business acumen and critical thinking seems to come as naturally as breathing. And after four years of his innovative leadership, Harman took center stage at the Grammy Awards and on American Idol, where its systems were featured (part of the reasons Harman Kardon and JBL are two of the best known brands in consumer audio electronics). BMW, Mercedes-Benz, Toyota, and GM rely on Harman, too. Luxury sound is booming, especially as China, the world’s largest automotive market. Paliwal has worked and lived in the United States, China, Switzerland, Singapore, Australia and India, learning the importance of different work cultures, ethics, discipline, and focusing on deliverables. Now he’s tackling the networked autobile demand. ABI Research predicts there will be 210 million web-connected cars on the road world-wide by 2016, up from 45 million by the end of this year. That includes Internet radio-supporting systems already rolling out from Ford, GM and BMW and after-market gadgets like the Pandora-friendly dashboard stereos. Paliwal says simply that it is a matter of recognizing that people can’t be expected to put aside their connected lifestyle when they get in a car. He also confesses to texting in the car–at red lights only–and wanted to provide a safer solution. He talked with Fast Company at length about disruptive technology, career moves, and integrating every part of life with business. What was your first job and what did you learn that you continue to use in your career today? After I finished my degree in India in 1980 I came to the US to get a masters and I was teaching quantum physics to freshmen. As I got my bearings as to what goes on in labs, I understood that to teach you have to learn. Have you ever experienced a challenge so great you wanted to back down? What happened? When I joined Harman we had taken some incredible assignments from BMW and Audi but we were way behind [in production] and risking the future [of the company]. Costs were going up. I had to hire more help from academia and spend a couple $100 million more. It was a tough call but in the 9-12 months after I [brought] in process streamlining. I took a hit in share price but I confident I was doing the right thing. I never thought I would back down. In hindsight, it was the best decision we made. We earned a lot of new business. Why do you think it is so important to incorporate SM into cars? I have a 23-year old daughter and 21-year old son. They are the market and they are starting to make some tough calls such as ‘why should I spend [money on a vehicle] if it doesn’t have my ecosystem in it?’ Also, people in LA, Bangkok, Shanghai spend 12-18 hours a week in their cars. Without an integrated system we will force them to cheat. Is there a danger of being “driven to distraction” the more integrated autos get with web and phone interfaces? Just the opposite. Humans get distracted when we see and touch something. We are least distracted when hear something, therefore we believe all information should be delivered through audio, even Facebook. We are also fine tuning gesture control. For example, if you simply make the gesture of lifting the phone to your ear the car will know. 50-70 gestures will be recognized at 5-7 points in the car. There are 650 million cars on the road right now. Something that keeps me awake at night is what is the solution for those driving 20-year old cars and how to come up with simple black box that would give you capability like a Kindle. [The box] would not an auto industry product, but something everyone can buy and priced around $100 so everyone can afford it. It would be capable of basic telephony, getting traffic reports, etc. You could use any phone and hear through device. That is my personal goal, to help the masses. The U.S. has tens of millions of cars. We have to look into that space very aggressively. Why was it important to forge partnerships with shows such as the Grammys and American Idol? We need to collaborate and partner more on the commercial side. We are partnering with the Olympics, too. But what is more crucial to long term success is partnering with tech companies such as Intel. A strategic partnership with us allows them to move into auto space. We are developing a microprocessor together. I have reached out to universities to fund more graduate study work as well. Students have no baggage and no bias about what they are doing. We are also reaching out to companies that develop certain medical software in China and Ukraine [to maximize] speed to market. We always have to decide what is a core development for Harman and what others can do that we can adapt. A recent core development for us was Quantum Logic. Now that almost 80-90% of music is compressed and people are listening to it through poor quality headphones, we developed an algorithm to sit on top of compressed music and recreate its profile. Commercially, we just launched this in Ferrari. We are not going to develop sound recognition, that is what you leave for IBM. I challenge my CTO and researchers to see where we can focus to develop our own. What do you see is the next “big thing” for Harman? In 3-5 years 10-20% of cars will be electric and hybrid, so all of a sudden you have a new safety hazard because they have no sound. Children under nine and adults over 70 can only determine how close something is by sound. We will develop different algorithms for different car engines and materials to correlate with speed sound pattern for safety. In HALOsonic technology, Harman and Lotus Engineering have worked together to jointly develop noise management solutions, using Lotus-patented Active Noise Control Technologies. Using quantum physics to cancel patterns that are disturbing to the ear and add what needs to be heard we addressed problems inside and out. Electronic Sound Synthesis (ESS) generates the desired sound of an engine, either inside or outside the car. Engine Order Cancellation (EOC) and Road Noise Cancellation (RNC) – cancels unwanted noise inside the car caused by engine vibrations or the road surface. Also, Harman’s GreenEdge systems, demonstrated in Prius, can bring energy use down 50%. More and more, I read how sustainable initiatives can become a culture. Change is a very big deal and I worked hard with my board to determine what we really care about and what our philosophy of reaching out is beyond new cars. We should be biased toward action. We are trying to be a nimble and cohesive culture where people can be heard and there is openness and innovation. Every quarter we give an award for a breakthrough idea even if it doesn’t make it to market.